Creatives have turned much of a Christchurch quake house into beautiful and useful objects. Porutu by Brian Flintoff. The porutu is a flute from the family of Raukatauri (Maori goddess of music) and is similar but longer than a koauau. It can be overblown, lifting its pitch and giving it a second register. It was an audacious and perhaps batty idea: Take a red-zoned home from Christchurch’s eastern suburbs and turn the entire thing into useful – and in most cases – beautiful objects. Entire meant entire. Everything would be reused: the wall paper, the electrical wiring, the rimu floorboards, the plaster and lathe, the bathroom sink. Everything. That was almost two years ago and on Monday week 114 of the useful objects – many of them indeed beautiful – will be auctioned to the general public. Proceeds go to the creatives and Kilmarnock Enterprises, a manufacturer that employs about 70 people with intellectual disabilities. The project, known as Whole House Reuse (WHR), has been on show at Canterbury Museum since early June. It was the brainchild of Juliet Arnott and Kate McIntyre and a stepchild of Rekindle, a social enterprise founded by Arnott that is best known for recycling wood from vacated earthquake houses into tables, chairs and artworks. Creative Tim McGurk contributed many pieces to Whole House Reuse Charity Auction. Whereas Rekindle used a tiny percentage of the materials available from quake houses, WHR set out to use everything from one house. It turned out to be a step too far. Unexpectedly, asbestos was found and the tainted materials had to be disposed of appropriately. And it turned out that some materials simply didn’t inspire somebody creative. Still, 398 objects were created from the materials of 19 Admirals Way, New Brighton. It was a 1920s, three bedroom bungalow and in many respects unremarkable. That was part of Arnott and McIntyre’s point: It was an “everyman’s home”, said McIntyre, just like the many thousands of Canterbury homes that have been demolished because of quake damage and are now mere memories and landfill burden. By reusing one entire house, WHR could pay homage to those lost homes and make the point that contemporary disposal methods are flawed. An entire house – or much of it anyway – could be reused. Perhaps the classic example is a set of dinning chairs by Tim McGurk and Trudo Wylaars, who shaped lath wood into seats. Lath and plaster were widely used to finish building interiors before the advent of gib board. Laths were the narrow strips of wood onto which plaster was trowelled. Lath held the plaster in place. It’s also why the museum exhibited WHR, he says. “A lot of the pieces are about honouring the house,” he says. The project’s intention and results were museum quality, he agrees. Which is why the museum intends to buy three items from the show for its permanent collection. One is a lath coffee table by McGurk. It features a striking ridgeline that projects out of the top of the table. The ridge could be a mountain range, breaking waves or an earthquake fault. Frame Chair by Mike Hindmarsh, a fine furniture maker from the Nelson area. More conventional but undoubtedly beautiful is “Frame Chair” by Mike Hindmarsh, a fine furniture maker from the Nelson area. The low single seat is a “place to relax and unwind” according to the auction catalogue. Made from highly finished rimu in from the “body-contact areas” — seat and back — and raw unfinished timber for the legs and frame, the entire chair is a “tribute to the material’s original purpose”. It’s an “especially fine piece of furniture”, says Arnott. Manufacturing dining tables from rimu studs was an obvious solution to the WHR challenge and two of New Zealand’s finest wood craftsmen — David Haig and Hamish Southcott — each built tables of exceptional quality, Arnott says. Haig is perhaps best known for his signature rocking chair. When studying the studs from 19 Admirals Way, he noticed the lathe and plaster had left a “ghostly ladder-pattern” imprinted in the wood. Rather than plane away all of that pattern, he incorporated some into the table. The result is a table clearly made of recycled wood — and a beautiful object — but with patterns that “maintain a connection with the wood’s source”, according to the catalogue. Tim McGurk’s lath coffee table features a conversation-starting ridgeline. Southcott’s table is likewise a large and fine recycled timber object, but his “Role Reversal Lamps” caught the eye of many museum staff and outside creatives, says the museum’s Neil Phillips. The lamps are role reversed because concrete piles from the house are no longer supporting something (the house), but are now themselves supported by something (rimu frames from the house). Role Reversal Lamps by Hamish Southcott caught the eye of many museum staff. Holes large enough for small LED light fixtures have been gouged out of the base of the piles and the power cords cleverly hidden. “No-one has thought to put lights in a concrete pile before,” says Arnott. Three of Southcott’s four lamps will be sold at the auction. Sculptor Hannah Kidd is known for her lifesized animals made from welded metal, For WHR, she made necklaces from “conduit”, the metal tubes that carried electrical wiring behind walls and under floors. It is a most utilitarian material from which to create “high fashion” necklaces, but that was her point: “to make something unexpected and, at first glance, unrecognisable from the materials selected”. Glass works by Frances Woodhead. The creative brief was that the final objects had to be useful, says Arnott, and designers seemed to find usefulness in different ways. “Some looked at a bath and made a bath,” says Phillips. Others wanted to make an object — say an easel — and went looking for materials in the WHR collection that could make an easel. The items being auctioned aren’t all large and likely to be expensive. Also going under the (silent) hammer will be rimu pens and chopsticks, totara serving spoons, and wooden toy cars shaped by Kilmarnock Enterprises. 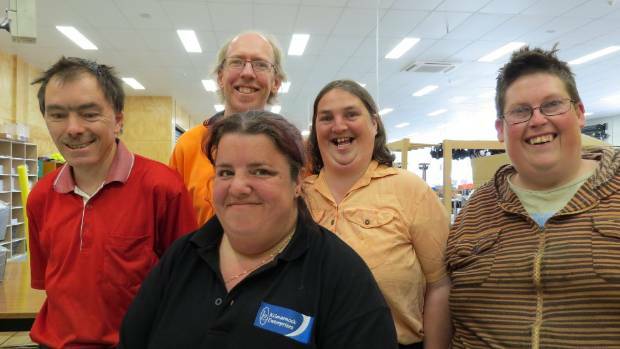 It’s a “contract manufacturer that proves how capable people are who have a disability,” says marketing co-ordinator Islay Rackham. WHR and Kilmarnock will develop a new collaboration after the auction, Arnott says. 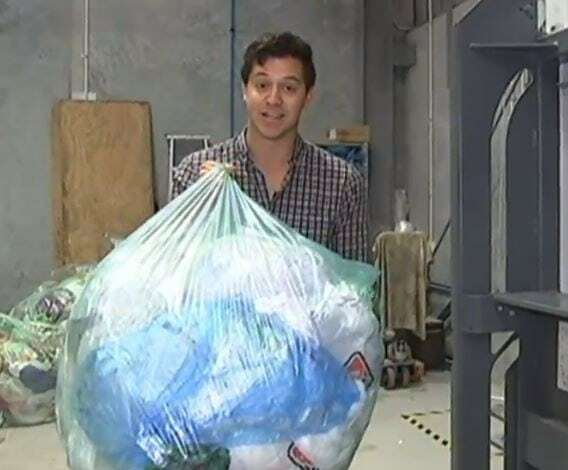 Auction proceeds and Creative NZ funding will be used by designers who can identify waste streams in New Zealand, create a product for Kilmarnock to manufacture and on-sell for profit. The house at 19 Admirals Way, New Brighton, Christchurch, before demolition. An example might come from WHR itself. Russel Frost, once from Tasman region and now of East London, made an alphabet from wood blocks, each with a letter carved onto them. Wood blocks were once used by the printing industry, even if metal was more durable and popular. Frost’s collection of WHR type blocks will be live auctioned as a set but he’s also hand printed limited edition posters, which will be sold in the silent portion of the charity auction. These posters celebrate the kowaro or Canterbury mudfish, an example of which Frost carved onto a wood block. He saw in the the little-known and threatened mudfish a “metaphor for the resilience of a population which is also in need of help”.